Welcome to Absolutely Dry Basement Waterproofing, Inc.
Do you have ground water seeping into your basement when there is a heavy snow melt or a lot of rain? Does water enter your basement either through cracks in the wall, at the seam where the wall and floor meet, or through cracks in your floor? Does your basement have a damp musty odor or even mold growing on the walls? Are you tired of dealing with this problem over and over? Well look no further, we can help! Absolutely Dry Basement Waterproofing Inc. services Eastern Iowa and Western Illinois. We are a full service basement waterproofing and foundation repair contractor. We specialize in residential basement repair services, including waterproofing and foundation repair. All of our employees are professionally trained at their job positions and receive on-going training year round. We offer free estimates and complete warranties on our work. Absolutely Dry has successfully waterproofed hundreds of leaky basements. Please refer to our services section for complete details of how we perform our work and what is available to you. 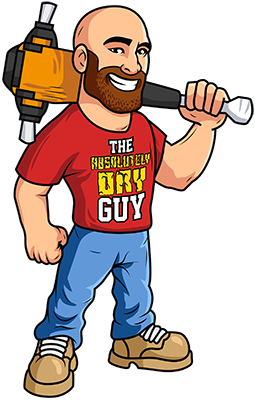 Call the Absolutely Dry Guy today for your free estimate at 800-981-0986. To provide you with the highest quality foundation repair and basement waterproofing results, we only utilize products from top vendors. Please click on the the logos below to visit our partners' websites. “Thank you for a job well done. Your crew was fast and courteous. You cleaned up after the job in exemplary fashion. “Thank you for the great job on our basement. You were very respectful of our house. “Your company did a fantastic job on waterproofing my residence at 29XX 20th Ave, Rock Island.